May the divine protect us while we are together. May all obstacles be removed which stand in the way of our understanding the truth that all is one and there is no division or separation between us. May we grasp this understanding with full comprehension and without doubt so all misunderstanding is dissolved within us. May we not cherish hatred anger or displeasure. May the space around us be free of fear. May the east and west, north and south be free of fear. May the earth be free of fear. May the past and future be free of fear. May we have no foes. May we all be friends. And may the entire human race unite in one fearless friendship. This week, we are exploring going deep inside to find the wise person within you to truly know thyself. Going inside to know thyself is a necessary perquisite to understand your heart's gift for the world and how to share it. This week, we will be doing some fascinating work as we dive deep into the wise Oracle within us to hear ourselves say what we maybe didn't know we knew. Do the brief yoga video. Do this week's Yoga Nidra practice directly followed by the journal. Supportive Materials are there to add supplementary information. Do the weekly Yoga Nidra practice. Note that this week's journal is to be performed directly after our Yoga Nidra practice. We will use the presence we cultivate in our Yoga Nidra practice to inform our inquiries for our journal exercise. You may choose to do the Yoga Nidra practice several times this week, in which case I might encourage the journal exercise each time, but that's up to you. Whichever you choose, make sure to do the journal exercise at least once. The teaching for this weeks theme is quite helpful to understand the purpose understanding self as Source or at one with all things. However, I always say that it's important to remember that that this course is not meant to be an intellectual exercise. In many ways we are trying to take our heads out of the picture and learn to feel into our gifts using our hearts. To do this deep work, we are using a deeper wisdom than intellect, the divine wisdom of our heart. Whether before or after you do the Yoga Nidra practice, at some time during the week read through or listen to the instruction about the theme for the week. Learning To Fly my myth I create which illustrates the yogic principles of Tapas, Swadyaya, and Ishvarapranidhana. This journaling exercise is designed to help you to hear the voice of the wise Oracle within you. 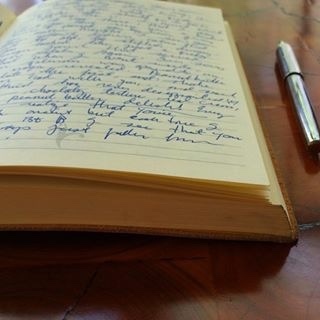 This journaling exercise should be done directly after doing the Yoga Nidra practice. What is my heart’s gift for the world? What are the perceived limitations that are preventing me from putting my gifts out into the world? How can I simplify or what can I refine or take away that will help me to most powerfully share that gift with the world? This week, choose someone who is an expert at what you do for your heart's gift and reach out to ask that person 3-5 concise, well-thought-out questions. If you're still trying to discover what that your heart's gift for the world is, choose one thing that you care about or are good at and ask an expert in that field. Try to stretch with this and find someone, maybe who feels a little out of your comfort zone, who is quite accomplished at what you do. This is a fascinating book which speaks at length about the gnostic gospels and the notion of heaven being something that is already within us.